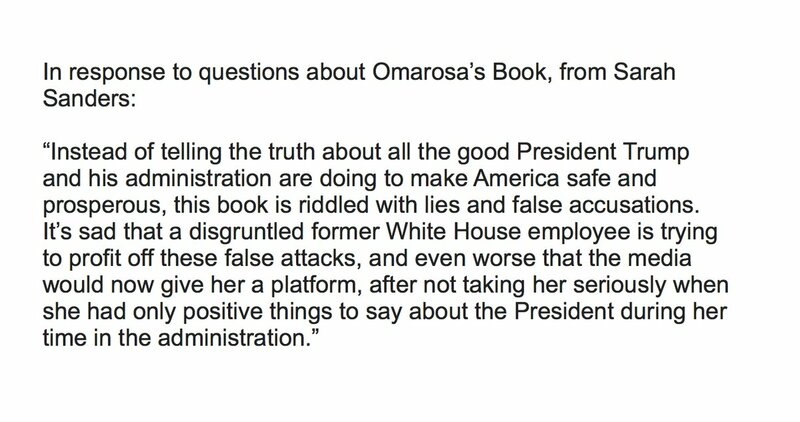 White House Press Secretary Sarah Sanders ripped into Omarosa and her new book today, calling her a ‘disgruntled’ former WH employee and saying the book is full of lies and false accusations. She also went after the media for giving Omarosa a platform when they ignored her when she only had good things to say about Trump. That’s a good point. The media loves to give negative press about Trump a platform, but you’d think they might have learned from liar Michael Wolff. But I guess it doesn’t really matter to them in the end, as long as it generates negative press about Trump and ratings for them.